1) Reduce Your Output: Put less in those garbage cans that go out to the curb every week by reusing what you can in your garden. Take a second look at twigs you've pruned from your fruit trees and turn them into bean teepees or raised beds. Use eggshells and coffee grinds for homemade miracle grow. Turn broken dishes or old window blinds into plant markers. Used tea bags, egg shells or toilet paper rolls find a second life as seed pots. And, of course, compost! As a result, there is more space in the landfills and less gas used by garbage trucks. and surrounded by garden twigs. This is its third summer. 2) Reduce Your Input: By reusing you end up needing to bring in less. Who needs bagged compost when you make your own? 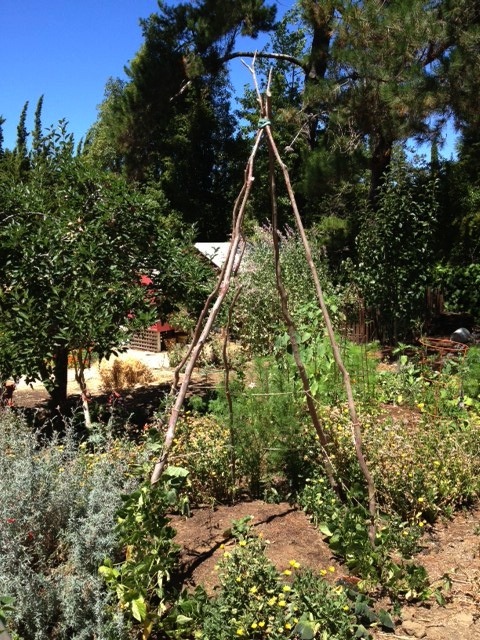 Who needs bamboo sticks for bean teepees when old branches do the trick? For my last two raised beds, I skipped store-bought redwood for raised beds and instead cobbled them together using sticks, pinecones and rocks. More and more, I propagate and grow from seed so that I don't need to bring in potted starts from nurseries. Old leaves or cut grass is more effective mulch than chipped wood brought in from a big box store. Less driving, less shipping, less plastic, more fun. more eco-friendly than bamboo sticks. 3) Save Pollinators: The news on honeybees and native pollinators is bad and it should concern any of us who like to eat. Scientists have identified two main triggers for bees' sharp decline: chemicals (pesticides, fungicides, herbicides, insecticides) and lack of food. You can take a small step toward helping pollinators by planting flowers (preferably natives or bee friendly varieties) and skipping the chemicals. 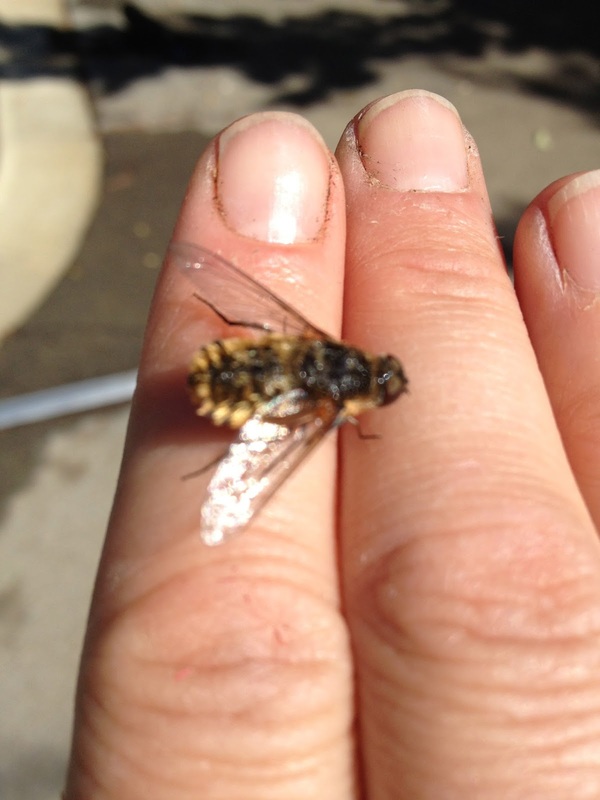 A California native bee. Any one know what kind? 4) Re-Create Lost Habitat: It is not just the bees who are having a tough time. The average population of common birds are down 68% over the past 40 years. Climate change, wind turbines and cats (try to keep kitty inside) are all major contributors to the decline of bird populations. However, one scientist opines "the top three threats to birds overall are habitat loss, habitat loss and habitat loss." Help make a dent in that lost habitat for birds, bugs and small mammals by creating a wildlife friendly garden. Plant natives. Take old branches and turn them into brush piles. 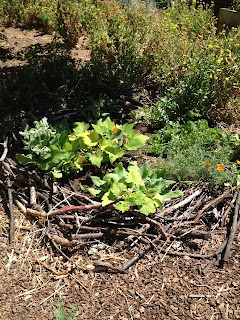 When feasible, leave dead trees up and create some sort of water source - even if it is just a bird bath. 5) Increase Biodiversity: Plant many different kinds of flowers, fruits and vegetables - including natives and heirlooms. For instance, I have 8 varieties of apples in my yard (yay for 5-in-1 apple trees!) Each variety requires different chill hours so some years I get more from one tree and some years more from another. I usually always seem to have a good amount of apples. Besides, more diverse landscapes support more bees, more wildlife. Diversity is a very good thing! 6) Get Inspired: All of these things can make a difference - especially if your actions inspire friends, family, neighbors. Unfortunately, I believe that that we are past the point - climate change-wise - where individual actions will suffice. Getting out into a garden, hearing the buzz of dozens of different pollinators amongst my flowers, tasting the first pear or tomato of the season, watching for baby birds, all of those things, though, inspire me to get involved more. To make that call to my representative, to write that letter, to sign all those petitions and even go to a rally or two. Getting out into a garden makes me realize just how much I want to fight to preserve this magic for all of our kids. Did you see that the Time cover story was about bees? I happened to see it in the bookstore Saturday. I wish someone would come plant (and take care of) a garden in my backyard. I've heard of this happening in some urban areas as a paid service. But really I just need to do it myself...eventually. Great post! Thanks for some good ideas to add to my garden. Betsy - I have a friend who used to do that (rented space in people's backyards to grow - did it in about a dozen homes). Just start small, with containers growing what you love to eat. Before you know it you'll be hooked! @Betsy: Yes, I saw the Time cover. I really hope that this issue gets more attention. It is super scary serious! @Christy: I knew someone who used to plant in other people's back yards too. 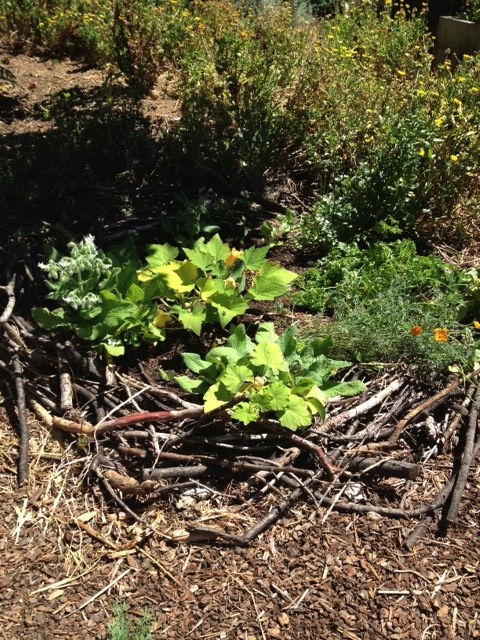 She didn't rent space but was paid by the folks to plant, maintain and harvest a veggie garden. Obviously, in the wealthier areas of town ;-) but there are lots of ideas out there.